I was on holiday in Vermont during 2010 when I met a friend of our hostess Jean Sheehey. Bob Lavery was a bright man whose body was failing as a result of the ageing process.We talked and it came to light that he had been in the Marines during the 2nd World War. He told me how he was on board the Battleship SS Texas when she had called in to Belfast, Northern Ireland, for repairs in June 1944. I recalled with him that I had been born on 1 July that year and that my mother had been in some difficulties giving birth to a big baby. 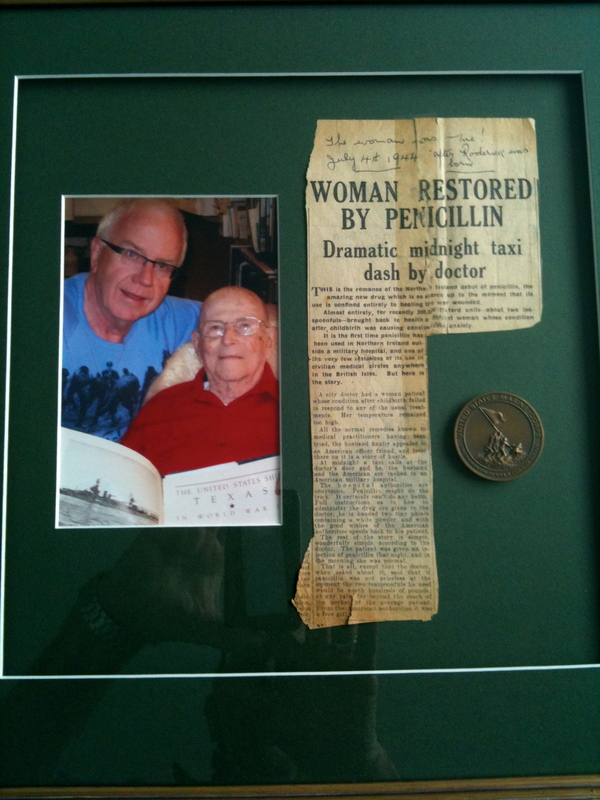 My father was told that unless he could find some penicillin my mother would probably die. His naval contacts of the day informed him that there was an American Battleship in Belfast and that this would have been a ship with a fully equipped hospital. Apparently it was notorious that the American services had this new antibiotic and that it was not available for civilians. Accompanied with his GP they went to the docks and were able to gain access to the American medics who were more than happy to facilitate the pair. The antibiotic was administered and my mother survived the ordeal to live to the ripe old age of 90. Bob and I surmised that without a doubt the penicillin was from the SS Texas and that he was on board at the time. Bob went on to recount that his colleagues were the Marines photographed and used on the Marines’ medal to commemorate Iwojima. His very own medal and a newspaper cutting outlining the dash to the docks in Belfast are in the photograph above which hangs on a wall at the top of our stairs. Rod—-I was so happy to be there when this fantastic coincidence came to light. It was an emotional day and one that Bob spoke of often. When he asked me to deliver the Marine Corps Medallion to you he said: “Give this to my buddy Rod…a reminder of how small this world is…a token to remember that day in July 1944 when the boat I was on carried the medicine that saved his mother’s life.” Bob died in June 2011 just before his 96th birthday. Rod lit a candle for him in Ireland. Thank you Jean. The memory still brings tears to my eyes.